Our approach to our backyard garden was to minimize our toil and, because we live in the high Chihuahua Desert, water. Our solution was to establish a backyard habitat populated with plants indigenous to this desert country. Two types of cacti were already thriving — a claret cup and a cholla. We planted a few more specimens. This one is an early bloomer. This claret cup cactus is nestling with a sage brush plant. We added small agave of various types, and, over the years, they have flourished and created a fence of agave. Salutary neglect along with Nature has produced a habitat in which lizards, bugs, birds, pollinators, and the occasional coyote make their living. 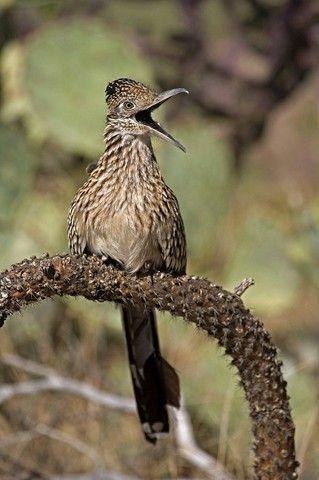 One of our favorite visitors is the roadrunner, a member of the cuckoo family. Roadie hunts lizards, bugs, nestlings; an opportunistic feeder. Roadie also hops onto our patio and peers through our sliding glass door. It’s as though he knows he’s safe behind the glass, and it appears he enjoys tormenting the cats and dog. “Roadie” is in Owen’s canine vocabulary, along with “mail truck” and “trash truck.” When we call out “Roadie!” Owen races to the patio door growling.